John has 20 years’ marketing leadership experience in the IT and telecommunications industry, spanning software, managed services and outsourcing. Before joining ShipServ, John was Director of Global Marketing for telecoms software pioneer Cramer Systems, where he was responsible for marketing communications and demand generation worldwide. In 2006 Cramer was acquired by Amdocs in one of the biggest ever deals involving a European software business. Previously, John held marketing management positions at Microsoft, Ariba, SAP and Oracle. John has received many awards in recognition of his marketing leadership and in 2009 was named Marketer of the Year by B2B Marketing Magazine. He has a B.Sc. in Computer Science from the University of Manchester. 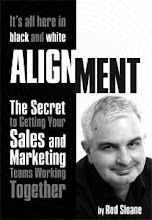 Is there a Sales and Marketing Alignment Problem?